The sun's out, and chances are you're already thinking about reclaiming your beach body. But before you start grinding away at ab exercises, make sure you're doing the right ones, the right way. With summer right around the corner, it's not too early to start thinking about those tight-and-toned abs you'll want to show off at the beach. Before you pull out the mats and start crunching, make sure that you're doing the best ab exercises—and doing them the right way. Otherwise, you may end up hobbling along the boardwalk instead of doing cartwheels in the sand. According to the American Physical Therapy Association, nearly two-thirds of Americans experience lower back pain, caused mostly by overuse, strain, or injury. Crazy idea, I know, but rather than causing or adding to any lower back pain you might already be feeling, your ab training should prevent lower back pain. Done correctly, a good ab exercise recruits not only your abs but also your diaphragm, lats, spinal erectors, and hip flexors. With these muscles contracted, the pressure falls on your middle, or thoracic, spine, which is more capable of handling it than your lower back. You should also choose abdominal exercises that allow you to actively engage your entire core. In a review of studies examining abdominal exercises, researchers found that the safest movements were those that avoid active hip flexion and fixed feet, don't require you to pull with hands behind your head, and correctly position your knees. 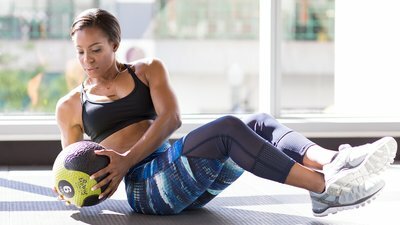 Another study looked at individuals with lower back pain performing abdominal crunches on an exercise ball with an elastic resistance band, versus using a machine. The researchers found that when people performed this kind of abdominal exercise, their lower back pain symptoms improved. The next time you're doing an ab workout, incorporate the following three exercises that have been shown to be safe for the lower back when done correctly. All three target your anterior core to help carve those six packs—along with targeting other key core muscles. This exercise targets the rectus abdominis, transverse abdominis, erector spinae, glutes, and hip adductors. Keep your core engaged throughout the entire movement, exhaling as you crunch. Avoid pulling your head with your fingertips, which can strain your lower back. Instead, focus on leading with your chest. And remember, faster is not better. By doing these slowly and under control, you'll be sure to feel the burn in your anterior core! Russian twists work your obliques, rectus abdominis, and erector spinae. Be careful not to over-rotate when you do this exercise, which can increase the pressure on your lumbar spine and lead to a lower back injury. As you rotate, visualize moving your thoracic spine, not your lumbar spine. Keep your shoulders down and back. Avoid tensing your upper back and traps. Tensing will make it harder to engage your core. These leg raises target your hip flexors, rectus abdominis, and obliques. As you begin to lift your legs, visualize pushing your lower back into the ground. Lower your legs only until your lower back is still in contact with the ground, a distance that will differ for everyone. To engage more of your anterior core when you do these raises, tuck your chin to your chest instead of keeping your head on the ground. When putting together an ab routine, or following someone else's, make sure the exercises you perform include a variety of different movements that engage your entire core. These movements include anti-flexion, anti-extension, and anti-rotation movements. Anti-flexion: Exercises such as cable crunches, that require you to resist a weight that attempts to pull your spine into flexion. Anti-extension: Exercises such as the low-back curl, that are the opposite of anti-flexion. The goal is to resist a load that attempts to extend your spine. Anti-rotation: Exercises such as the ab wheel or stability ball rollout, that resist the force that attempts to rotate your body. Any exercise, such as the Pallof press, done with a weight held on one side of the body, is also an anti-rotation exercise. Complex movements such as squatting and deadlifting are also excellent additions to your core workout. Neil, A. (2012). Most Americans Live with Low Back Pain–and Don’t Seek Treatment. Monfort-Pañego, M., Vera-García, F. J., Sánchez-Zuriaga, D., & Sarti-Martínez, M. Á. (2009). Electromyographic studies in abdominal exercises: a literature synthesis. Journal of Manipulative & Physiological Therapeutics, 32(3), 232-244. Sundstrup, E., Jakobsen, M. D., Andersen, C. H., Jay, K., & Andersen, L. L. (2012). Swiss ball abdominal crunch with added elastic resistance is an effective alternative to training machines. International Journal of Sports Physical Therapy, 7(4), 372.